New Image Technologies is the leader in Graphic Installations and Removals. Located in South Elgin, Illinois, 45 minutes outside of Chicago, we have been assisting companies with their install needs since 1987. With 75 plus years of combined experience installing pressure sensitive vinyl (PSV) graphics on fleet vehicles, building wraps, retail stores and more, NIT is the proven leader for your advertising installations. 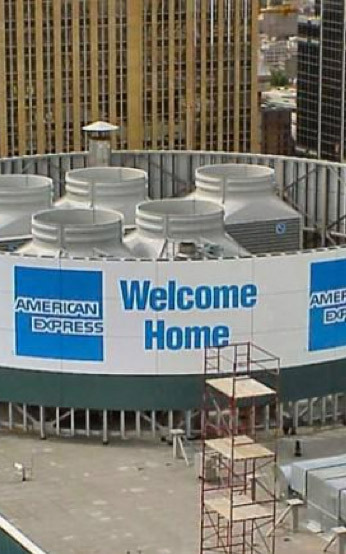 To see examples of our large-format specialty installs, such as water towers and sports arenas, click here. We are equally known for our ability to remove graphics quickly and efficiently. NIT has developed innovative ways to remove graphics including the development of our own adhesive removers. In 1996 the company was granted a US patent for SS-1 Adhesive Remover. NIT made the decision to share this product with our competitors and other consumers to improve our industry as a whole. SS-1 removes all styles of adhesives not just adhesive used for graphics. This revolutionary product is used all over the US and Canada, if you would like more information on our SS-1 Adhesive Remover, click here. NIT works closely with ad agencies and digital and large-format printers to install graphics in retail stores, museums, and sports arenas, including Olympic and Super Bowl venues. We work with hundreds of graphic manufactures not only in the US, but in Canada and Europe. Please call today for any of your graphic installation needs.